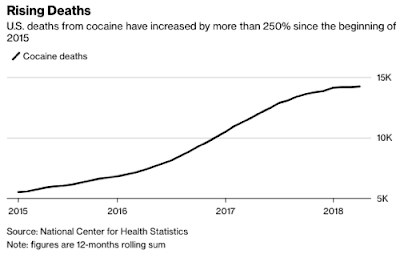 Overdose deaths from cocaine rose 22 percent from a year earlier to 14,205, according to data from the CDC. 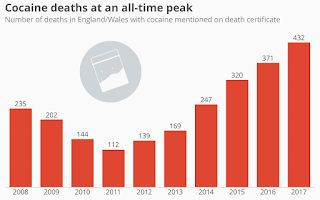 U.S. deaths from cocaine have increased by more than 250% since the beginning of 2015. The trend is similar in the UK. 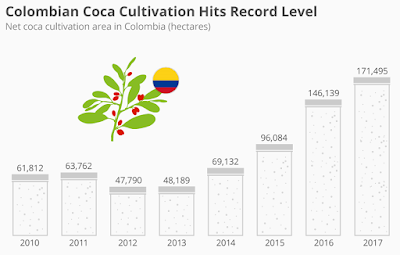 Cocaine purity has risen steadily with production while prices have fallen. The EU says the purity of street-level cocaine is at its highest levels ever. Crack carries a high risk of death as addicts often push cardiovascular and respiratory systems to collapse.